Units Drop-down list box: Use this drop-down list box to select the unit of measure for writing barcodes. StartX Text edit box: Use this text edit box to specify the X coordinate. StartY Text edit box: Use this text edit box to specify the Y coordinate. Width Text edit box: Use this text edit box to specify the width. Height Text edit box: Use this text edit box to specify the height of the search box. Use Colors Checkbox: Select this checkbox to enable writing color barcodes. If this checkbox is not selected, the demo will use the default barcode color, BLACK, and the default space color, WHITE to write the barcode. Transparent Checkbox: Select this checkbox to enable writing barcodes using a transparent color. This option is not recommended because the written barcodes cannot be read with all images. Bar Color Browse button: Click this button to open a Color dialog to select the color to use for the bars when writing barcodes. Space Color Browse button: Click this button to open a Color dialog to select the color to use for spaces when writing barcodes. Barcode Type Drop-down list box: Use this drop-down list box to select the subtype to write. 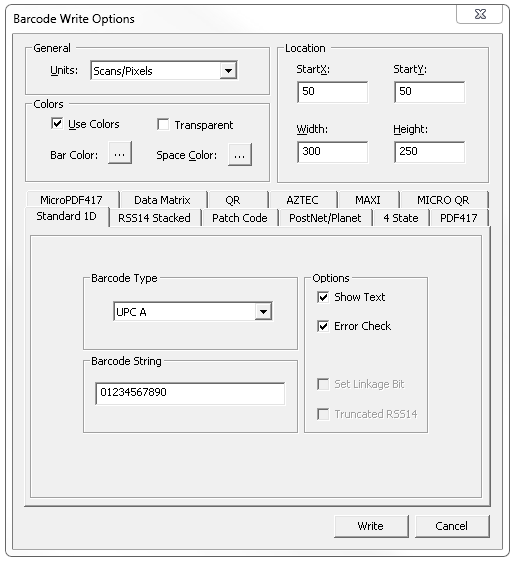 Barcode String Text edit box: Use this text edit box to enter the string to be written. Write button: Writes a barcode over the image, using the criteria set in this dialog. Cancel button: Cancels writing a barcode and closes the dialog.